Stuck in the Inner West with nothing to cure your Monday doldrums? Look no further, your Monday blues have been cured. 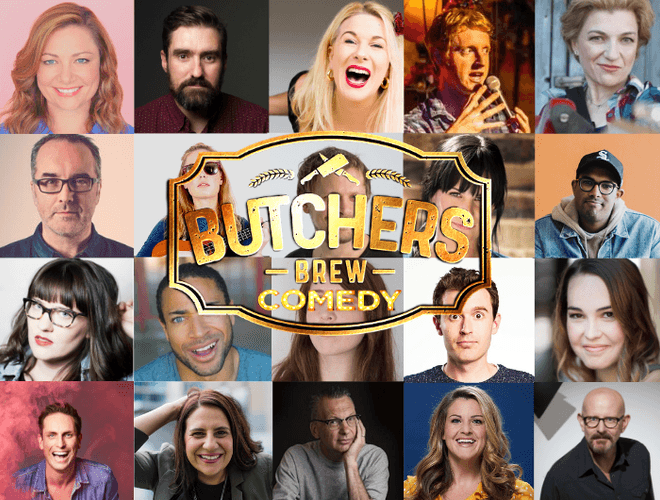 Butcher’s Brew is a fantastic new live entertainment venue on Marrickville Rd, Dulwich Hill. Hosting a raft of some of the country’s best comedians each week, it is the perfect way to ease yourself into the work week—with good friends and a good laugh. The space was a butcher shop from 1962 until it’s recent sale, and it still bears traces of its past. Small square mint, teal and white tiles still nod to a butcher’s welcome in the entrance, and the pole and brackets that once displayed sides of meat on hooks now hold up a reclaimed-timber side bar. The colour scheme is a warm and the styling eclectic, lending to a relaxed, intimate atmosphere that once in, is hard to leave. The drinks menu isn’t especially focused. The cocktail list is small but delicious, and they have a great wine list. Young Henrys and Batch are on tap, and there are other craft brews in the fridge. They also offer small cocktail pizza and drink specials for those coming down for comedy, and the bar has a deal with nearby Japanese restaurant Manmaru. Customers can order anything and chef Takako Fasolin will run your meal over, and the food is to die for. It is the perfect place to spend a relaxed Monday night. Come and join us.